As a member of the Axis, Romania was ill-prepared to assist the Germans in their struggle in the East. After facing the full might of the Soviet offensive at Stalingrad, much of the armored forces had been lost and what remained were second-class units, blatantly unable to cope with the latest Russian tanks. Since the Germans were unwilling to send them additional tanks, an expedient was chosen. Since the offensive started in 1941, the Romanian forces had managed to capture many Soviet 76.2 mm (3 in) field guns and vehicles (175 tanks and 154 artillery pieces), especially T-60s. According to Lieutenant-Colonel Constantin Ghiulai, this Soviet light tank was reliable and fast, and could provide an excellent gun platform, inspired by Germany’s Marder. The idea came to engineer Leonida, which worked on a prototype fit for limited production, according to Romanian industrial capacities of the time. 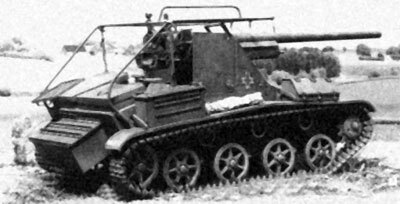 This vehicle was ready by January 19, 1943, and after trials and minor modifications, accepted and rushed into production as the Tun Anticar pe Afet Mobil (TACAM) T-60 (Or “Self-propelled Gun on Mobile Carriage T-60”). 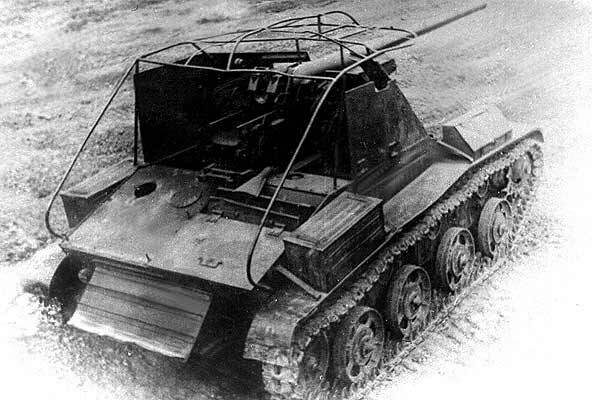 Basically, the TACAM T-60 was a turretless chassis with a Russian 76.2 mm (3.00 in) M-1939 F-22 field gun mounted on top without carriage, and a three-sided shield protecting the servants. In many cases, the original GAZ engine was replaced with a Dodge-Derotto-Fargo (under licence) F.H.2, and a new engine cover with better cooling was adaptated. The suspensions were reinforced to cope with the added weight, with stronger torsion arms and new roadwheels (on the late series). The shield plates originated from captured BT-7s and other Soviet tank hulls, and were 15 mm (0.59 in) thick and sloped. The frontal part was pierced in a cross-like shape for direct vision and increased traverse. Maximal traverse was 32° and elevation +8 -5°. Forty-four rounds were carried inside and partly in the four storage boxes mounted on the front and rear of the mudguards on each side. To soften the massive recoil and reduce the rolling, a rotating brake (to be firmly dug into the ground) was fixed at the rear of the hull. There was a hull machine-gun for close defence. The hull frontal armor was increased to 35 mm (1.38 in), and in other parts to 25 mm (0.98 in). The gun was not designed for the antitank role, but the muzzle velocity in direct fire was nonetheless impressive, and the HE rounds had enough punch to do some serious damage to a T-34 and destroy and disable any lighter vehicle. Early version TACAM T-60, with the original spoked roadwheels. A frame aerial could hold a tarp which protected the crew from weather and could provide a basis for ambush camouflage nettings. 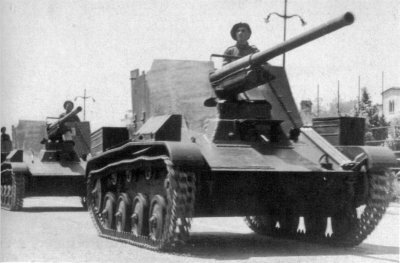 Late version TACAM T-60, autumn 1944, with full roadwheels. 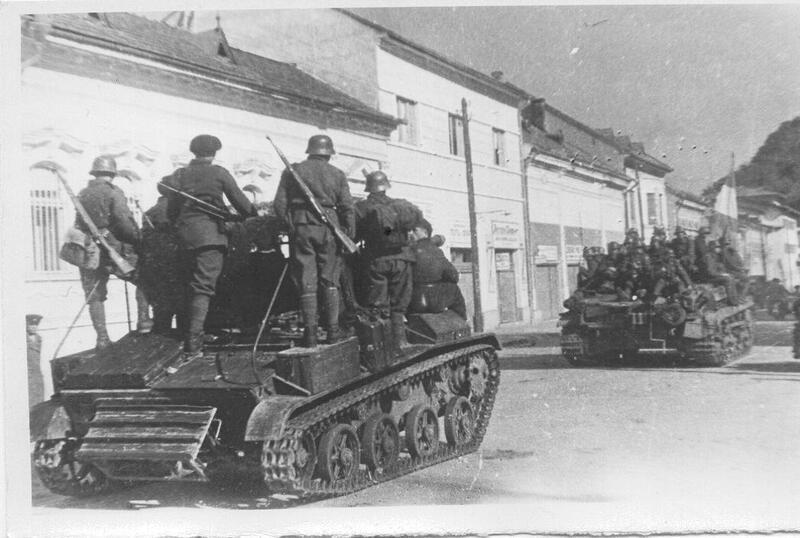 This was just before these surviving vehicles were recaptured by the Red Army in October.